McLaren has officially unveiled the highly anticipated McLaren MP4-12C 2011. The McLaren MP4-12C is a two-seat mid-engine model. The supercar is powered by a twin-turbo 3.8-liter V8 engine producing around 600 horsepower and 433 lb-ft of torque. The engine is coupled to a McLaren seven speed Seamless Shift dual clutch gearbox (SSG). It sprints from 0 to 60 mph in less than 3,5 seconds and can hit a top speed of more than 200mph. When developing the McLaren MP4-12C, the engineers were focused on reducing weight, so the car features a Carbon MonoCell, light brakes, lightweight exhaust pipes, an airflow-assisted airbrake and a small and compact engine. The McLaren MP4-12C is revealed as the first in a range of high-performance sports cars from McLaren Automotive, the independent car division based at the McLaren Technology Centre in Woking , England . The 12C, and future models within the range, will challenge the world's best sports cars, benefiting from the expertise and virtuosity of the McLaren Group. “It is a long-held dream of mine to launch a range of high performance sports cars that set new standards in the industry,” said Dennis. “We began designing and building cars for aficionados of thoroughbred sports cars almost 20 years ago. Incorporating the leading edge technologies that the McLaren Group has built up within its various companies, I believe we are now perfectly placed to open up this new chapter in McLaren's history as well as play a part in the regeneration of high-tech manufacturing in the UK and global automotive environment,” he concluded. 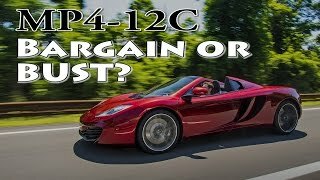 The first car from the new company, the McLaren MP4-12C, is a high performance two-seat mid-engine model in the ‘core' sports car market segment for cars costing between £125,000 and £175,000. The 12C is pure McLaren, featuring no carryover parts from any other car, and will be produced by McLaren in the UK . It goes on sale through a dedicated, worldwide retailer network in early 2011. The 12C MonoCell not only brings dynamic benefits, but also offers fundamental engineering opportunities that form the basis of the car's unique character. It has been designed to allow a much narrower structure overall which in turn contributes to a more compact car that is easier to position on the road and more rewarding to drive . Antony Sheriff explained. “With the 12C we are redefining the relationship between performance and practicality, as well as performance and efficiency, achieving leading positions in both. We have designed this car from the inside out. We have a saying in McLaren – ‘everything for a reason' and the 12C will surprise people in many ways. “A clear illustration of its special qualities is in the efficiency of its power delivery. With the 12C's power output of around 600hp and its low CO 2 emissions, it delivers the highest horsepower to CO 2 ratio of any car on the market today with an internal combustion engine...and that includes petrol and diesel hybrids,” Sheriff concluded. The 12C is powered by a bespoke McLaren ‘M838T' 3.8 litre, V8 twin-turbo engine producing around 600bhp, driving through a McLaren seven speed Seamless Shift dual clutch gearbox (SSG). It is targeting not only new standards for power and performance in its sector, but also class-leading fuel economy and CO 2 emissions; supported by McLaren's experience of active aerodynamics to aid cooling, grip, handling and road holding. “The 12C is all about performance,” said Sheriff. “And in McLaren, we have a very broad definition of performance. We don't just look at the traditional one-dimensional parameters like top speed, we focus equally on useable measures such as in-gear acceleration times, braking performance in all conditions, and efficiency of power delivery combined with the lowest possible fuel consumption and CO 2 emissions. Sure, 12C is very fast, but it is also the most efficient, most driveable high-performance sports car in the world. “There are so many examples of race car process and technology transfer in the 12C,” claimed Glover. “The car owes much to McLaren's experience and success in motor sport. The advantage of technology transfer is only one element; speed of decision-making and development, F1 processes and people all make an important contribution. “We have spent most of the programme ‘adding lightness',” said Mark Vinnels, McLaren Automotive Programme Director. “If the cost of reducing weight brought performance gains in speed, handling or economy, we did it. However, if the expense could deliver improved performance elsewhere we didn't pursue it. We never set weight targets as such; we set cost-to-performance targets and examined everything in this way. “Worldwide demand for high performance cars is strong, in large part because of great cars from great competitors. With McLaren joining that list, it will grow stronger still. What we are offering is a new approach to the market, through a skilled, solid, debt-free and risk-managed company. McLaren is right to take this step now and support future growth of high-technology manufacturing and engineering jobs in the UK ,” Dennis declared. “By the time the 12C is launched in 2011 we expect the economic conditions to be much improved. We have already seen significant interest in the car and the supply of the 12C will be relatively scarce; in its first year we plan to produce just 1,000 cars which represents only 3.5 per cent of the ‘core' market,” explained Antony Sheriff. “We have created ground-breaking new technology, lightweight engineering solutions, and harnessed real-world motor racing applications. It brings new levels of performance, fuel efficiency and practicality to the 12C's segment. And it will be more exclusive than its principal competition with a price that reflects its lack of ubiquity,” he said. “This is the start of an exciting new chapter in McLaren's history, in British high-technology engineering and manufacturing, and in global sports car design. We aim to be the best, but will leave that ultimate judgement to our first customers in 2011. Until then, we will strive to put one name at the top of the ‘most wanted' list for buyers of high performance sports cars: ‘McLaren',” he concluded. 'M838T' is a unique McLaren power unit, developed specifically for the 12C. It is compact, lightweight, very stiff, and offers an uncompromising combination of very high performance and good driveability, with excellent economy and CO 2 emission values. Taking power and emissions in combination (measured by its horsepower to CO 2 ratio), the 12C delivers its power at greater efficiency than any other car on the market with an internal combustion engine, including hybrids. “It's a little bit like the first pressure on a camera shutter button. There's no requirement for the driver to use it but it is more satisfying and engaging if you do. The SSG also promotes seamless shifting in which the driver doesn't have to reduce engine power at all – rather than the gearshift slowing you down, it actually speeds the car up by recovering the energy of the crank spinning as it drops engine speed,” he said. The design of the standard cast alloy wheels (19” front, 20” rear) was driven by McLaren's light weight objectives: the light weight styling was agreed in concept, then the wheel was tuned using Finite Element Analysis to take a further 4 kg out of the wheels. Bespoke Pirelli tyres have been developed in conjunction with McLaren specifically for the 12C. Frank Stephenson, McLaren Automotive Design Director, helped finalise the design: “Like most designers it's a boyhood dream to work with high performance sports cars. They are the purest expression of speed and purpose and, with increased consumer demand in this market and environmental aims to the fore, offer designers the ultimate challenge. “With the interior, we have created a real step forward in the packaging of a sports car. Moving the driver and passenger closer together improves driving control and moving the pedals improves the problem of wheel well intrusion. We also repackaged many of the major components that normally sit under the dashboard to allow for more space and a unique form. Packaging is one of the 12C's really strong points,” said Frank Stephenson. This is one of the many reasons the 12C design is able to buck the trend towards ever wider sporting cars. The innovative information centre provides all normal telematics functions such as audio, navigation and telephony, while providing some new features never before seen in a car. Meridian , the renowned producer of state-of-the-art sound systems, is developing its first ever in-car system for the 12C. Different engineering teams have cars undergoing specialized testing including hot weather in Bahrain in the height of the 2009 summer, cold weather testing in the Arctic , engine development, gearbox calibration, electrical testing and ride, handling and durability programmes. “Quality is the most important thing to customers,” said Foster, “and quality management is a fundamental part of building a McLaren. For my team it is an absolute passion. It doesn't matter whether a customer is spending ten thousand pounds or a million, it is their money and they rightly expect to have pride in their purchase and be satisfied with it. Our goal is to ensure that we exceed customers' expectations,” he concluded. Early planning indicates that 25 per cent of sales will be made in the UK , 25 per cent in the USA and the remainder to the rest of the world, notably Germany and mainland Europe , the Middle East and some Far Eastern countries. Although the McLaren MP4-12C has a comprehensive standard specification, customers for such an exclusive car want to have the ability to specify bespoke items, interiors and special equipment for their own car. McLaren has extensive experience of meeting these needs for McLaren F1 and SLR customers.